The ÖtillÖ race in Sweden is one of my favorite endurance events that is on my wish list. Competitors need to cross 26 islands swimming in total 10 kilometers and running 65 kilometers. An incredible tough race set in an amazing scenery. I had the chance to ask the winner of this world famous swimrun race 5 questions. 1. Last year you guy's won ÖtillÖ. Can you tell us more about this years race day? "We prepared ourselves similar to last year (we thought –why change a winning concept). So during late spring and summer we focused only on swimrun which for us means just swimrun races, no racing running competitions or triathlons, and at least one long swimrun session a week. Apart from that we try to get two interval sessions of running and adding some distance running and swimming to that. We always try to do a couple of sessions together. Me and Paul Krochak had won Engadin swimrun during the summer and I had competed in and won a couple of other swimrun races, none of us had any long periods of illness or injury either so we felt strong and confident prior to start of ÖtillÖ. Prior to race start we had a pretty clear race plan. We wanted to keep our own pace during the race and don’t get fooled to a though start. During the first 5 hours of the race we felt like we were flying through the course. We did not use that much energy during the swims so we could push hard on the runs and by then we had a lead of about 4 minutes. However, in a race this long and with elements this tough you can drop from feeling a 100% to having to dig deep for energy in matter of minutes. Unfortunately that became the case for us and Team Milebreaker/Öppet have used that in order to pass us and gain a lead of a minute or two about 6 hours in. During the long run on Ornö (20k) we decided to change our focus, not being stressed about being second team, instead do our own race for the remaining 2 hours (then it was not just about the win, it was about keeping second place as well as we had teams coming from behind). Once making this mental turnover we actually managed to increase our speed and on the end of the long Ornö run when we reached a 300 meters swim the first team was still in our sight. I kept an eye on the clock and estimated the gap to about 4 minutes, we pretty much understood that our winning chance was close to zero if Lelle and Daniel wouldn’t hit the wall harder than ever, so the last hour of racing was all about keeping a good racing attitude, telling some jokes and looking forward to the beer at the finish line. It is always nice to reach the island of Utö and see at the finish line family, friends, staff. Lelle and Daniel gave us a warm runner up welcome. I was a mediocre swimmer between age of 10 to 17, then had a very short and not successful water polo career. I then started to run mainly just to keep in shape but noticed I was passing guys in club singlet’s and thought I might try to join a running club, so in 2006 and joined FK Studenterna, a Stockholm long distance running club. In 2008 I wanted a challenge and signed up for Kalmar Järnmannen (which is now Ironman Kalmar), on the Ironman distance. From then I focused on Ironman racing until 2012, when I did my last triathlon and finishing with a 8:31 Ironman. The main reason leaving triathlon was that I never enjoyed the bike and I also thought it was to time consuming training. 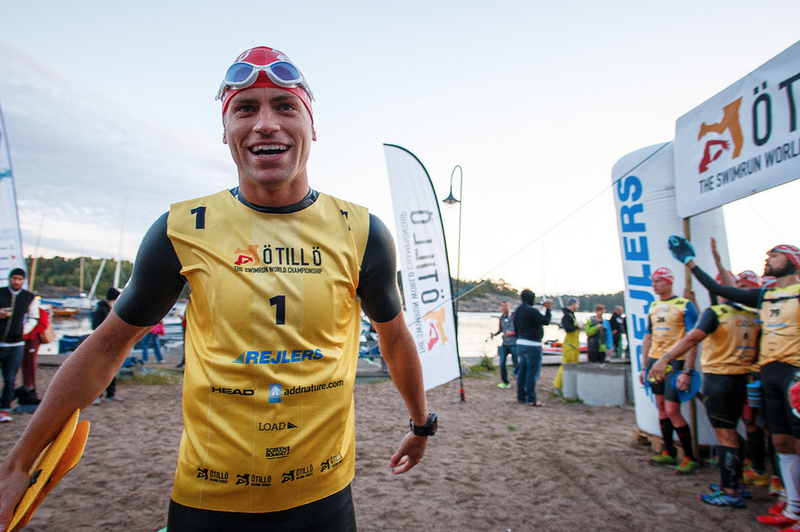 Swimrun was there for the perfect fit for me and by then I had competed in ÖtillÖ together with Antti Antonov 4 times, winning in 2011. So from 2012 I mainly do running and swimrun races, Hooking up with swimrun partner Paul Krochak in since 2013. In regular life I am in the late stage of my medical training starting to work as a junior doctor next year. Compare to others, I train few hours, on average about 10h/week, since I don’t have that much spare time. I always try to fit my training in as a way to commute, running to and from the hospital. I always try to think “most bang for the buck”, i.e. much quality training. 4. What would be your advise to swimmers, runners and triathletes? Endurance sport, mainly triathlon, has become almost obsessive among many. Remember, sport is sport, if it is no fun, don’t do it. For me family and career will always be more important than racing. 5. What races are on for next season? No plans yet. I will start my medical career next year and I know how busy I will be so no decisions yet. However, sometime I really really would like to break 8 hours on the ÖtillÖ course!" Thanks for your time Björn and I wish you all the best!